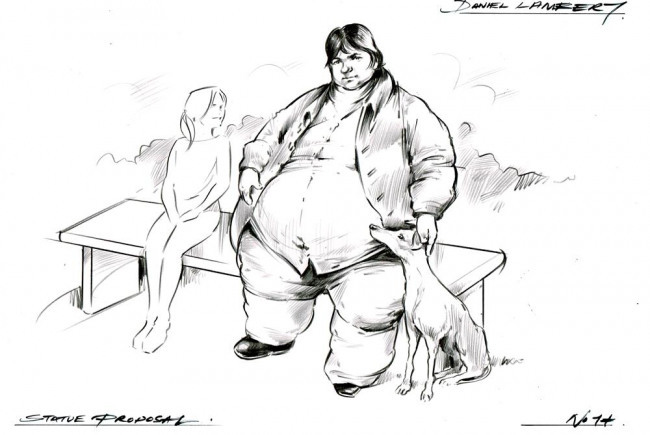 To have a life-size bronze statue of Daniel Lambert made by the well-known English sculptor Sean Hedges-Quinn and to install this in a prominent site in Leicester city centre, ideally Jubilee Square. Daniel was described on his gravestone as having an 'exalted and convivial mind', not just a very large man. He has been remembered with affection in Leicester for more than two hundred years. He has a room devoted to him in the Newarke Houses Museum, a statue of him is long overdue. The first actual book on Daniel 'The Daniel Lambert Picture Book' by Roger Street is now available from www.artesius.org. The Daniel Lambert Society has been formed to honour the memory of the great man, and to promote this by initiating and supporting projects to achieve this aim. The Daniel Lambert Society was formed at the Guildhall Leicester (in the presence of the Lord Mayor) on Wednesday 13th March 2019, Daniel's birthday. There were about a dozen founder members and this number is increasing. As well as honouring the memory of the great man by initiating and supporting projects and annual dinner is to be held on Daniel's birthday each year. Project Delivery Manager: The Daiel Lambert Society The Project Delivery Manager takes legal responsibility for receiving and spending the funds raised and ensuring the project is delivered.